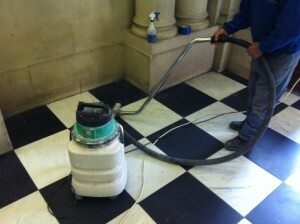 We offer a marble floor polishing and renovation service. This includes grinding, de-lipping, cleaning and polishing. Stone floors can look tired and worn out over time if they are not cared for but our specialist service can transform such floors into a gleaming as new state. We use Â specialist techniques and professional grade Klindex equipment. Our team is very experienced and can achieve unbelievable results. Marble floors respond to this treatment in the most dramatic way. The nature of the stone is that it will take a high shine. We can vitrify some floors, this is where a special chemical is used along with the rotary polishing machine to really bring out the bling. Limestone floors can attract a great deal of dirt over time as they are more porous than marble, in particular if they have not be treated with a stone inhibitor. 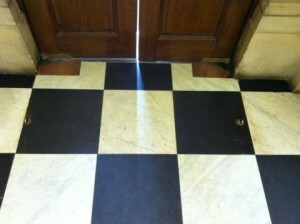 Often this can cause an otherwise light coloured floor to look extremely dull and dirty. 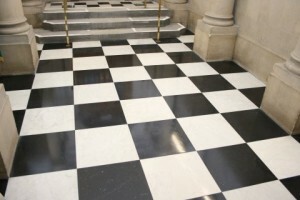 By using our specialist machinery and cleaning techniques we can clean these types of floor and leave them a nice honed finish that can be treated with stone stain inhibitor which makes for easier ongoing maintenance. Travertine floors are a little more time-consuming to bring back to their original fine as new state. the nature of this stone is that it has many natural holes or a honeycomb effect in it’s structure. Often these holes are factory filled on the top surface and honed Â to create an appealing and smooth tile. Depending on the quality and type of fill you can find that the filler pops out over time exposing the honeycomb effect of the natural stone. We can refill these floors and then polish them with our specialist equipment to get back to an as new state. There are many fill and finish choices for these types of floor so best to ring us and discuss your options in more detail.